Discopop Directory: Chris Martin is a witch. Burn him! 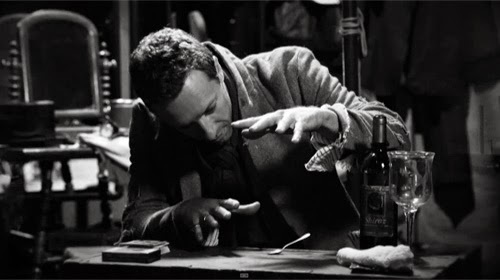 Chris Martin has been raiding the dress-up box for Coldplay's new video, Magic. The singer and concious uncoupler plays both hero and villain in a black-and-white potboiler, where Cecile, a beautiful young circus performer, must choose between Claude, "her mustachioed husband, the famous but drunk magician," and her assistant, Christoph. Shot in the style of a 1930s silent movie, intertitles and all, it stars Crouching Tiger's Zhang Ziyi as Cecile and is the work of Swedish director Jonas Akerlund, who'll you know from Lady Gaga's Paparazzi, Christina Aguilera's Beautiful and, err.. Me Julie by Shaggy and Ali G.
I won't spoil the plot - but both video and song are pleasingly light-of-touch from a band who often veer into self-righteous pomp.